In December Taiwan will be getting a new city. In fact, it will be the most populous city in the entire country: Xīnběi Shì (新北市). For those not familiar with the situation, I should perhaps give a bit of background. Taiwan won’t suddenly have more people or buildings. Instead, the area known as Taipei County (which does not include the city of Taipei but which occupies a much greater area than Taipei and has a much greater total population) will be getting a long-overdue official upgrade to a “special municipality,” which means that it will get a lot more money and civil servants per capita from the central government. And as such the area will be dubbed a city, even though in appearance and demographic patterns it isn’t really a city at all but still a county containing several cities (which are to become “districts” despite having hundreds of thousands more inhabitants than some other places labeled “cities”), lots of towns, and plenty of empty countryside. The Mandarin name will change from Táiběi Xiàn to Xīnběi Shì. (Xīn is the Mandarin word for “new.” Xiàn is “county.” Shì is “city.” And běi is “north.”)The official so-called English name is, tentatively, “Xinbei City.” Hanyu Pinyin! Yea! Talking about “English” names is often misleading, since many people conflate English and romanization of Mandarin; and the usual pattern of Taiwanese place names not written in Chinese characters tends to be MANDARIN PROPER NAME + ENGLISH CATEGORY (e.g., “Taoyuan County”). So, at least in this post, I’m going to be a bit sloppy about what I’m calling “English.” Forgive me. OK, now back to the subject. A couple of days ago, however, both major candidates for the powerful position of running the area currently known as Taipei County (Táiběi Xiàn) had a rare bit of agreement: both expressed a preference for using “New Taipei City” instead of “Xinbei City.” Ugh. 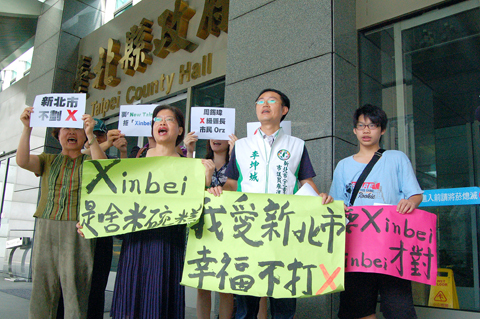 And to top things off, a couple dozen pro-Tongyong Pinyin protesters were outside Taipei County Hall the same day to protest against using Xinbei because it contains what they characterize as China’s demon letter X. Actually, that last part of hyperbole isn’t all that much of an exaggeration of their position. The X makes it look like the city is being crossed out, some of the protesters claimed. The protesters would prefer the Tongyong form, Sinbei. I suspect foreigners here would rapidly change that to the English name “Sin City,” which I must admit would have a certain ring to it and might even be a tourist draw. Still, Tongyong has already done enough damage. Those wanting to promote Taiwan’s identity would be much better off channeling their energy into projects that might actually be useful to their cause. The reason the government selected “Xinbei City” is that “New Taipei City” would be too similar to “Taipei City,” according to the head of the Taipei County Government’s Department of Civil Affairs. And, yes, they would be too similar. Also, Xinbei is simply the correct form in Hanyu Pinyin, which is Taiwan’s (and Taipei County’s) official romanization system. It would also be be much better still to omit “city” altogether. Consider how this might work on signs, keeping in mind that Taipei and Xīnběi Shì are right next to each other. So such similar names as “New Taipei City” and “Taipei City” would run the risk of confusion, unlike, say, the case of New Jersey and Jersey. I wonder if the candidates for mayor of Xinbei are under the impression that they should change the name of the town across from Danshui from Bālǐ to something else because visitors to Taiwan might otherwise think they could drive to the Indonesian island of Bali from northern Taiwan. They probably said they liked “New Taipei City” better because it sounds “more English” to them. And it is more English than “Xinbei.” But that’s not a good thing. But things that make sense and politicians don’t often fit well together. Consider the signs. What a @#$% mess this could be. Let’s compare a few ramifications of using Xinbei and Taipei vs. using New Taipei City and Taipei City. Now let’s look at the case of New Taipei City and Taipei City. The Taipei County Council will determine the final version of the name in September. This entry was posted in Chinese, Hanyu, Mandarin, pinyin, romanization, signage, Taipei, Taiwan, Tongyong and tagged ?? ?, sinbei, taipei county, xinbei, xinbei city by Pinyin Info. Bookmark the permalink. And on “English name”, I agree it’s not the most appropriate term to use in English texts, but I don’t think insisting that the Taiwanese adopt the appropriate English term into Mandarin is a good idea. In English, “Latin” has a firmly established use to refer to the script; in Mandarin, less so – saying “?? ?” may be just as silly/confusing/inappropriate as using “? ?” when talking about names that are neither English nor Latin. Ultimately, the letters are as much English as they are Latin. What the Taiwanese call “? ?” has the letters j, u and w that the ancient Romans didn’t have, and the ancient Romans also didn’t invent their script from scratch, so what makes “? ?—” so much better than “?—”? @dl7und: OK, then, so Ma Ying-jeou is his English name (I’ve never seen Ma Ying-jeoh as you suggest), while Ma Ying-chiu or Ma Yingjiu are the Romanised forms of his name. Given that Ma seems to keen on adopting Hanyu pinyin, I’ve always found his chosen spelling of his name slightly ironic. So when a form in Taiwan has a space for an English name, it’s OK for someone with a Chinese name to put Anette, Apollo, Ovid, etc.? Of course, the pronunciation problem would be solved if the western press included Chinese names in brackets as is the practice on, for example the Taipei Times website. I suppose he does ???? [mínyì diàochá] surveys before any decision. getter, so was never considered. ????????? [Gù g?ngrèn “wú pòlì.”] So it is often said he lacks guts. It is really really stupid. Thanks for the update, Meow. According to that story, the Civil Affairs Bureau, which had already selected “Xinbei City,” has now backed away from that, instead submitting to the Ministry of the Interior three choices: Xinbei City, New Taipei City, and Greater Taipei City. I have nothing good to say about the latter two. Well, which one do you believe that will be the final decision? At least Hong Xiuzhu supports Xinbei City. Horse Hero 9! Codename HH9. Actually he already is codename ?? (Zhongxing), see http://radioscanningtw.jidanni.org/index.php?title=????? . X is a Latin letter, not a Chinese letter. These protesters are petty.